Printed on a Monoprice Delta Mini. 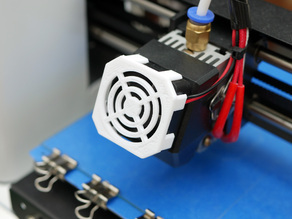 Shown on the 30mm fan on the Monoprice Select Mini V2, as well as the Delta Mini. (I made one for each). Fit is tight - a little filing / sanding on the inside of the legs will make it fit much better. I used a raft, as I am still tweaking height for the first layer on my Delta Mini.